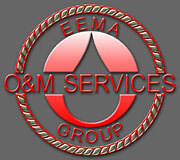 EEMA O&M SERVICES GROUP is a full service water and wastewater contract operations and maintenance firm. Our fully trained and licensed staff includes skilled operators, maintenance mechanics, health and safety officer and engineering advisor. Our people have been in the contract operations and maintenance business for over twenty-five years. The O&M SERVICES GROUP knows the challenges involved in operating, and maintaining your water and/or wastewater facility. The O&M SERVICES GROUP understands your concerns and has a proven delivery system of integrated services to solve all your facility ownership, and O&M needs. We are at the forefront of the contract operations and maintenance market in offering total solution services. Our O&M services provide cost-effective management that will allow you to concentrate on your core municipal, commercial or industrial activities. 24-hour-a-day, 7-day-a-week on-call service to respond to any system failures. The O&M SERVICES GROUP understands that you may have some questions regarding having the O&M of your facility managed by an outside company. Quality is paramount in each assignment we perform. We recognize that the information we develop and the professional advice and services we offer are used by our clients to support important management decisions involving human health and environmental protection issues. The O&M SERVICES GROUP maintains a corporate total quality assurance/quality control (QA/QC) program to ensure high-level work performance at all times. The O&M SERVICES GROUP believes that quality in all aspects of our services can be achieved, and we are committed to giving our customers responsive, high-quality services. The O&M SERVICES GROUP is actively committed to the protection of human health and the environment. Our Health and Safety Program is based on the premise that the health and safety of O&M SERVICES GROUP personnel, subcontractors, and clients is an essential and non-negotiable part of every O&M SERVICES GROUP project. The O&M SERVICES GROUP’s Health and Safety Policy assigns health and safety responsibility to all levels of management and project implementation. Prior to beginning work on any field project, a site health and safety plan and/or accident prevention plan must be completed and approved in accordance with OSHA and the O&M SERVICES GROUP Operating Practices. The completed and approved health and safety plan must be on-site and accessible to all field personnel who are subject to conformance with the health and safety plan. The plan will be as concise and succinct as possible, conform to the outline from OSHA, and contain information specific to a site or even a particular task on a site.